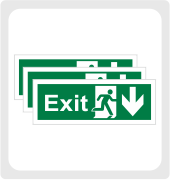 Fire Exit/ Exit Signs are designed to highlight escape routes within a building, in the event of a fire or other emergency that requires the building to be evacuated. There should be several Fire Exit and Exit Signs clearly positioned around the premises and above fire/ emergency exit doors. All signs should indicate with an arrow/ or running man, which direction people need to take to the nearest emergency exit, depending on where they currently are within the building. 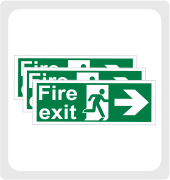 Our range of Fire Exit Signs includes standard Fire Exit Signs, Exit Signs, Photoluminescent Signs and Hospital Compliant Signs. All of our Fire Exit/ Emergency Exit Signs are available in a range of different materials and sizes. All signs, where applicable, comply with BS EN ISO 7010 UK and EU Legislation.